"I'd just like to tell you that my ring arrived yesterday and it is beautiful, even better than than I imagined it would be. ...it is gorgeous and all you can see is diamonds. I looked for months to find the perfect setting for my 1.03ct diamond, even in bespoke jewellers in my area but I'm so happy that I chose to use your company because the Halo ring was exactly what I wanted but cost so much less. I was quoted £895+ (approx $1750) by jewellers in my area, but I ended up paying half of that so Im really pleased. It also fits really well too." 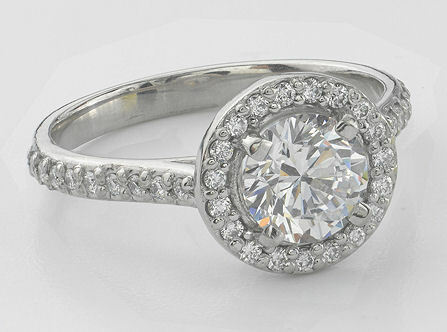 Our micropave halo ring is one of the most stunning rings you will find, anywhere. 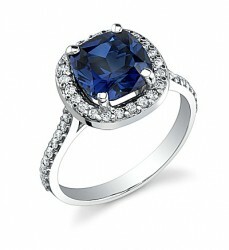 We are proud to note that this ring was selected by Miss America 2010 for her own wedding set. This ring was painstakingly developed, entirely in-house, using our top-of-the-line, CAD-design system and took 5 months to perfect (design, cast, set, review... repeat until perfect). The result of this effort shows in the beauty of the Halo ring. 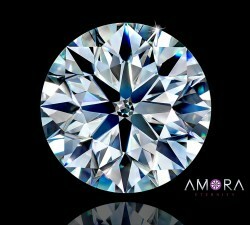 Computer precision ensures exacting alignments, showing maximum diamond and minimal metal. Continuous refinements during development ensure comfort and ease of wear. The 37 individual white natural diamonds are precisely arranged to serve as the ultimate backdrop to the 1ct center, version 6 Asha or for your own center diamond. Besides beauty, we added other important details like a comfort-fit shank, a curved base to to the basket, and set the center low (only 1mm higher than the center stone). This was to ensure the ring not only looked stunning, but is both comfortable and practical to wear. Further, because we made this ring entirely in-house, there is no middle man adding their own markup along the way, which allows us to price our Timeless Halo ring at far less than you will find at any retail store while still offering extremely high-end quality. If you are looking for a ring that offers outstanding comfort and beauty, and sparkles from every angle, our Timeless Halo ring should be near the top of your list. News - Matching band now available: Due to your feedback, we have added a new matching wedding band. Details here. Available in platinum, and can be made in palladium by special order. When ordered in Platinum or Palladium, our Timeless Halo Micropave Ring is among the only rings available in the world that are 'High Pressure Enhanced' after casting. 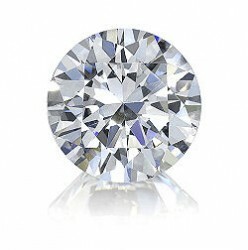 Height of stone off of finger: A 6.5mm round sets 5.25mm high. I did a ton of research before buying this and it's literally the most beautiful, sparkly ring I've ever seen. I got the hearts and arrows center cut 1.3 carats and I get stopped daily with compliments. I am blown away!!! My Fiance bought this ring in platinum and a .75 ct MIRA moissanite center. It is absolutely stunning and I get tons of compliments. I never thought I would be able to get a platinum engagement ring but BTD made it so affordable! It is dainty and well crafted. I love how low it rests, and the finger coverage is perfect. There is sparkle at every angle. I recommend BTD to everyone, and I will buy from them in the future. I received this ring a couple of weeks ago and all I can say is it is truly amazing! I have received nothing but compliments on it. 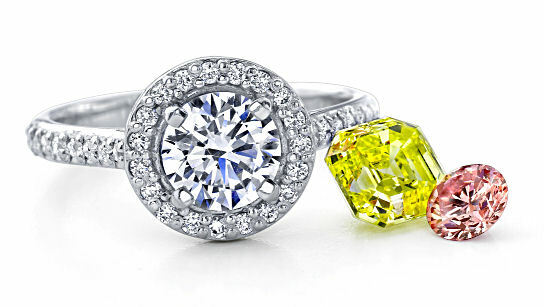 We looked at many local jewelery stores and could not find a halo setting that we truly loved. After reading the message boards for many months we decided to go ahead and order it -- very glad that we did! It blows the other settings we have seen out of the water. The setting is very delicate and it shows off the Asha center stone perfectly. The halo does not show a lot of metal but highlights the stone...you see fire from every angle. The stone is phenomenal. If you have any hesitations - DONT. We will definitely be ordering the matching band shortly.